I consider it a milestone! We went to Costco this weekend with the kids. We normally pile all four kids in a cart and push (or pull) a second cart with whatever we are buying. This time, we changed it up a little. We decided to let them walk as long as they held onto the cart. As soon as they stopped, we were planning on putting them back in a cart. Having 3-year-old quadruplets running around Costco didn't really sound fun, but I really felt that they needed the opportunity to try. And they did GREAT! We got there, and I showed them how to hold onto the cart. 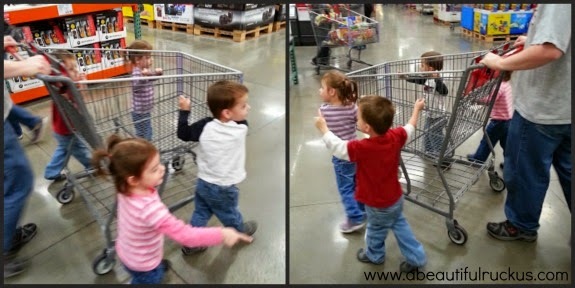 Caleb and Abby thought that the rules were that they had to hold on with two hands, so even when I tried to help them let go with one hand, they clung to that cart like it was a lifeline. Nobody let go the whole time. We didn't have any runners. It was a total blow-out success! Yay! This summer, we also started using some essential oils with Caleb, specifically to help him stay focused, grounded, and plugged into reality. They are also soothing and calming, which is a nice plus! Autism is a hard road, and one of the things that he really struggles with is anything related to hygiene. It takes two of us, and we literally pin him down to clip his nails or cut his hair. Those are huge fights with lots of tears, kicking, and all sorts of stuff. It's beyond frustrating as parents, and I know he hates it too. This weekend, both of the boys needed haircuts. I started with Elijah first. While I was cutting his hair, Sean said that he was going to give Caleb his oils to see if it would help calm him down. He used 1 drop each of two different blends (2 drops total) on the back of the neck. 10 minutes later, it was Caleb's turn, and he sat down in the chair without crying, trying to escape, or fighting us at all! He sat very calmly, let me cut his hair, and off he went. That has NEVER happened. NEVER. It doesn't matter how many times I see oils work for our family, it still floors me to see how quickly and thoroughly they work when we use them. And since Caleb is only 3-years-old, I know that we didn't trick him into sitting still. So grateful we got through that without a fight! Also, Caleb officially has the best hair cut of his life! Abby and Caleb got to skip a few hours of school this week so that we could go visit the audiologist. 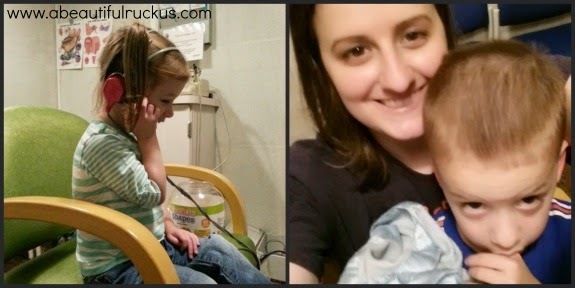 While all four kids passed their hearing screenings in the NICU, we thought it prudent to recheck Abby and Caleb. Back in February, the kids had a mini hearing screening as part of the preschool application process. Abby only passed the screening in one ear. We thought it might be because she was a little wiggle worm, but we also notice that she has problems responding to us sometimes. During Caleb's autism testing this summer, the developmental pediatrician felt that there was a strong possibility that he is dealing with apraxia of speech as well. He asked us to recheck his hearing to make sure that a hearing loss wasn't contributing to his speech problems. The testing was a little different for each of them. Abby played a game where a noise would sound in one ear, and when she heard it, she was supposed to put a plastic cookie in a jar. She thought the game was fantastic! And she also passed with flying colors! It turns out that her hearing issues are actually listening issues. Yep, that doesn't surprise me at all. Caleb did a different test where he sat on my lap. Instead of wearing headphones (which he wouldn't have been okay with), he sat in a room with me. There were large speakers on the walls. The idea was that he would naturally turn toward the noise if he heard it, and it would be reinforced with light up toys if he got it right. He also passed just fine! While the test didn't tell us how each individual ear is working, it told us that overall, he can hear without issues. So that issue is crossed off of our list, and we will continue with speech therapy to help him catch up. Elijah's teacher sent me this photo from preschool last week. 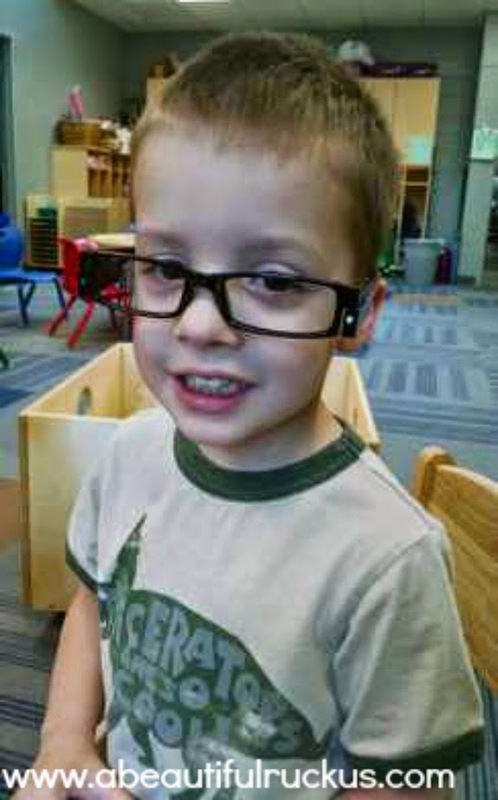 Elijah found a pair of glasses in the classroom, and apparently put them on while walking around saying, "It Daddy! It Daddy!" Sean has glasses that look very similar to that, and he was pretty proud to look like the man he looks up to. :) We told him not to worry. He will probably end up officially wearing glasses at some point in the future. They are (still) doing construction and renovations on our school. 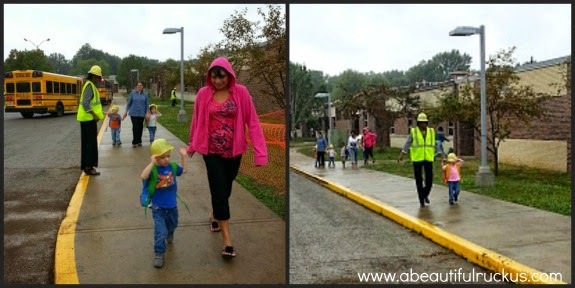 It was raining on Monday, and they got a bunch of plastic play hard hats from somewhere for the kids to wear as they walked out to the car line. It was pretty cute watching them wear the same thing that all of the construction workers are wearing on the other side of that red fencing (in the left photo). The only problem? The kids had to give the hats back when they got to the car so that other kids could use them. Abby was SO offended! Hats are her thing. She LOVES them! The only thing that helped her calm down was me reminding her that we have hats at home. Oh, the tragedy of being 3-years-old! On our way home from school this week, we were talking about how Jesus likes it when we are nice to our friends. The conversation morphed into talking about how Jesus can see everything and knows what is going on. Me from the driver's seat: Jesus is in charge of everything! Ellie (our resident leader): Um...that makes me feel jealous. Oh my gosh! I laughed so hard! I hope she loves school this much forever! what oils did you use and do you apply directly? I am confused about direct application for kids. Thanks. OK I laughed out loud at Ellie saying "um...that makes me feel jealous." and then that video of Abby was the icing on the cake. I adore children.